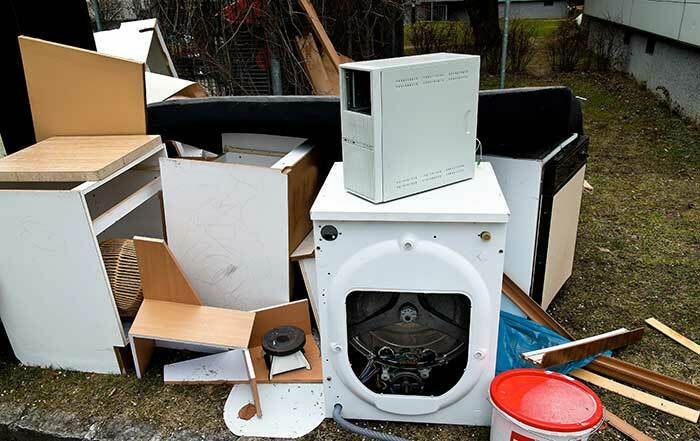 Appliance Removal and proper disposal of appliances can be a difficult and sometimes dangerous undertaking. In fact, without the right help it can be a strain on your body, your wallet and the environment.With Texas Trash Haulers you can rest assured that your outdated, broken or hazardous appliances are removed and disposed of with the utmost attention and professionalism. We take due care to safely and efficiently remove the items without stress to you or damage to your home or business. If at all possible we will recycle and/or donate your discarded appliances to help reduce environmental waste and overcrowding of the landfill. Texas Trash Haulers will take away that old dryer or washer or any appliance that has seen its day. have everything needed for the job. Although not much, they have the lifting cranes, pickup trucks and dump trucks for the job at hand. They are insured and therefore you will face no liability should a worker be injured in the process of the appliance removal. Hiring a professional appliance removal company is so refreshing. You just need to pay the fee and then sit back as they do all the work. The Texas Trash Haulers crew will come right where the appliance is. They offer curbside services. You have probably been wondering what to do with that broken stove that is a bad eyesore for you in your garage. The good thing is that you can now get rid of it easily, by hiring Texas Trash Haulers. Not only do they remove broken down appliances like fridges, TVs, Radios, computers and peripherals. In addition, they will remove old, sodden carpets, mattresses that you don’t need any more, broken furniture and all forms of junk, trash and waste.